Will L.A.’s Defense Bounce Back in 2016-17? There was much to be desired on the Kings’ blue line a season ago. A team that had great talent and equally great expectations was left standing at the first round alter, forced to watch the rest of the playoffs from the luxury of their pacific homes. The season may have ended against San Jose (the eventual Western Conference champions), but it started to dwindle when the Kings could not win their division. Had they finished the regular season ahead of Anaheim, the NHL postseason could have entered an altered timeline that would have made Doc Brown and Marty McFly giddy. But they couldn’t get the job done in 82 tries, and five swift games later the party came to an end. Hockey is as team oriented as a sport can be, and it’s impossible to place all of the blame on the single area of a club. L.A.’s offense sputtered in and out of consciousness throughout the course of the season, and Jonathan Quick definitely had his low moments in an otherwise superb season. Defensively, the Kings were not nearly as consistent as they needed to be when it mattered most. Defense was, is, and will always be (shout out to Bret Hart) the strength of a Darryl Sutter coached team, which is why San Jose’s dismantling of it was downright shocking. The Sharks did what they wanted, how they wanted, when they wanted against the Kings’ backbone. The best part of past hockey failures is that it’s just that, the past. L.A. will embark on a new season in just a few months, with a clean slate and some Pine-Sol to wash off the stench of last year’s defensive stink. But what will be different? For the Kings, a new year brings up similar problems on the blue line. And how they are handled will determine if next year produces a brand new result, or more of the same heartbreak. Long before Drew Doughy slayed the beast of the Norris Trophy, this was his defensive unit to lead. He has steadily improved since entering the NHL in 2008, and has continuously added more to his deeply skilled array of talents. Doughty has never put together a more complete season than his gem in 2015-16. Big minutes, offensively active, while ensuring that the defensive end of the ice wasn’t compromised one bit. It was beautiful. And it wasn’t nearly enough to hide all of the Kings issues. What more can Doughty possibly do for his team? If his performance last year wasn’t a wake-up call that the Kings need better sustained play around #8, then I shudder to think what is. Doughty might not have the same motivation from a year ago, having always had the elusive Norris Trophy as extra motivation to improve. Without it, he will have to find a new device to command his focus to be the best. Should Doughty take a small step back next year (and he’s only human so it is possible), his teammates around him will be forced to shoulder more of the load. Last year’s main problem might have been that with Doughty’s brilliance, other deficiencies could be hidden, temporarily. That’s a dangerous game, and one that doomed the Kings in the long run. Doughty’s great, but it takes more than one defenseman to create a great unit. Have we figured out what to call the trio of defensemen that compliment Doughty in L.A. yet? The Triple M’s? M to the third power play? The three eM-igos? I’ll keep trying. 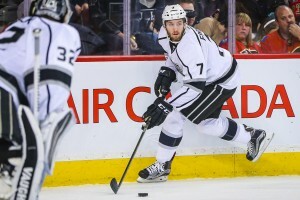 In any event, Brayden McNabb, Alec Martinez, and Jake Muzzin comprise the second tier of the Kings defensive core. Each player is at or approaching their respective primes, and has shown signs of growth and improvement for the team in black and white sweaters. Martinez also got significantly better, developing in the complete opposite direction of Muzzin. You can always count on #27 in the defensive end, but Martinez started to showcase his offense. His confidence has been naturally beaming since he scored the two biggest goals in Kings history in 2014, and Martinez has used that confidence to become a worthy power play option. Nothing he does oozes flash or sensationalism, but his game is certainly worth noting on offense. Brayden McNabb had an up-and-down year for the Kings in 2015-16, and that may be as mild as one could possibly put it. He spent the majority of the season as Doughty’s partner, where he had his good and bad moments. The most frustrating aspect of watching McNabb play was identifying that he actually could play the game well, when his head was in it. He has good instincts, is a very tough player, and had the hockey sense to gel well with an elite level defenseman (which is much harder than it looks). I don’t blame the Kings for bringing back McNabb on a relatively cheap contract, given their other salary cap issues and the familiarity factor. But McNabb has to improve for this team to advance past the first round of the playoffs. If he doesn’t, Sutter may have to debate breaking up their successful second pairing of Martinez and Muzzin. Can Martinez bounce back from the injuries that severely crippled L.A.’s defense at the end of last season? 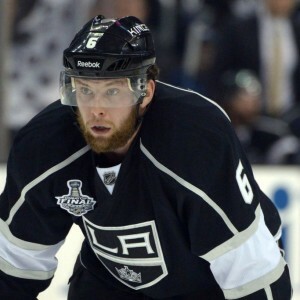 And if Muzzin is forced to play with a new partner, how will he respond? Remember, part of Muzzin’s growth as a player was due to his partnership with the steadiest point man on the Kings roster. 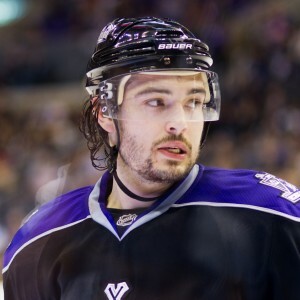 The good news is that L.A. has Doughty, and three serviceable supporting defensemen. The bad news is that the pieces are unique, inconsistent, and at times, plagued by injuries. That’s when the next group comes into play. Completing the bottom of the Kings defensive depth chart is usually where general manager Dean Lombardi really earns his money. This is a cash strapped team that has invested most of its money in high-end forwards, all-world goaltenders, and Dustin Brown. The Kings just don’t have the resources to build a legion of defensive drones, so they must resort to cost-effective, low risk yet high reward type of players. The 2016-17 season will be no different at the end of the blue line rotation. 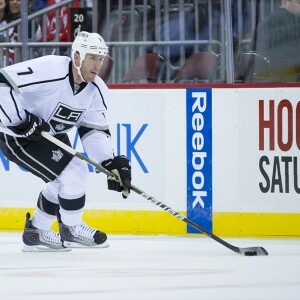 Luke Schenn, the Kings “big” trade acquisition on D last season, is gone. Fighting for those final two spots will be a slew of players ranging from unproven rookies to grizzled veterans. Rob Scuderi has a chance see significant time, given his reliable history and the mini-rejuvenation he experienced last year after L.A. reacquired him. Still, 37 is a ripe age in hockey terms, and Scuderi’s best strides are clearly in his rearview. The same could be said about Matt Greene, who was nearly bought out in a last-ditch effort to clear cap space for Milan Lucic. It didn’t work, and awkwardly Greene is still a member of the team that basically phased him out all of last year. It’s hard to believe that Greene (33) is four full years younger than Scuderi, but his game has been ravaged by injuries. There may be a place for him at the end of the rotation if he stays healthy, and if he adjusts his game accordingly. Those days of Greene monitoring the ice like a predator, waiting for his next victim are over. He needs to simplify everything to have a chance at real ice time. Tom Gilbert and Zach Trotman were brought in this off-season, in moves to bolster the Kings’ blue line with size. Sadly, I don’t see either as a major factor. Trotman struggled to play well with Boston, a team that caters everything towards their defensive end. Gilbert is 33, was once an adequate point man in the defensive hell known as Edmonton, but has regressed in Montreal the past few seasons. I never doubt Sutter’s ability to find diamonds in the rough, but these are Master’s level projects. If there’s anybody in the organization that has a realistic chance of cracking the rotation come October, it’s Derek Forbort. A former first round pick, Forbort has the natural defensive skills to fit in nicely at the end of their rotation. He’s always been known for his defense, so he doesn’t have to re-commit to his own zone like a Jake Muzzin. At 24 years old, the Kings are growing impatient waiting for Forbort to develop and grab the NHL bull by its horns. This may be his best, and last chance to do so. There are two things you can count on next season; Doughty playing upwards of 30 minutes a game, and Lombardi adding another defenseman to the Kings’ dressing room. L.A. still has a little bit of cap room to play with, and history clearly states that the opening night defensive core will not be the same one in March. Luke Schenn was a worthy gamble that didn’t quite pay off, but don’t expect the Kings front office to stand pat at the next trade deadline. There are always veterans looking to play for a contender, and disgruntled players looking for a better system to thrive in. Existing issues notwithstanding, the Kings have proven that they offer both of those luxuries. Defenseman are often overlooked and underappreciated. Win a game 5-2, and your offense receives countless praise. Notch a 1-0 victory, and all the glory goes to the goaltender. But everybody, whether they like to admit it openly or not, respects those backwards skating fellas on the far end of the bench. The Kings sure do, because they know that their upcoming season depends on them.